During early events of brain development (~E9), the most anterior part of the neural tube becomes segmented to form the (left): prosencephalon (forebrain), mesencephalon (midbrain) and rhombencephalon (hindbrain). These three primary brain vesicles are then subdivided (~E11) into 5 vesicles (right) that continue to develop into all brain structures. 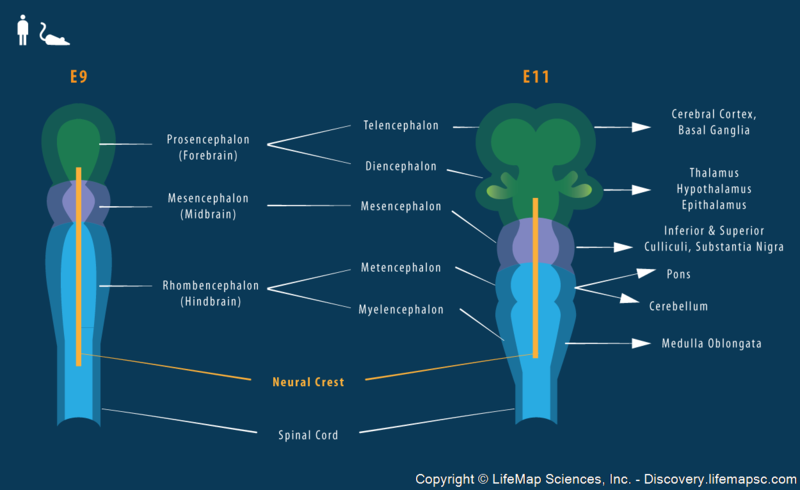 The cranial neural crest originates in the anterior part of the developing embryo, between the mid-diencephalon and the forming rhombencephalon.